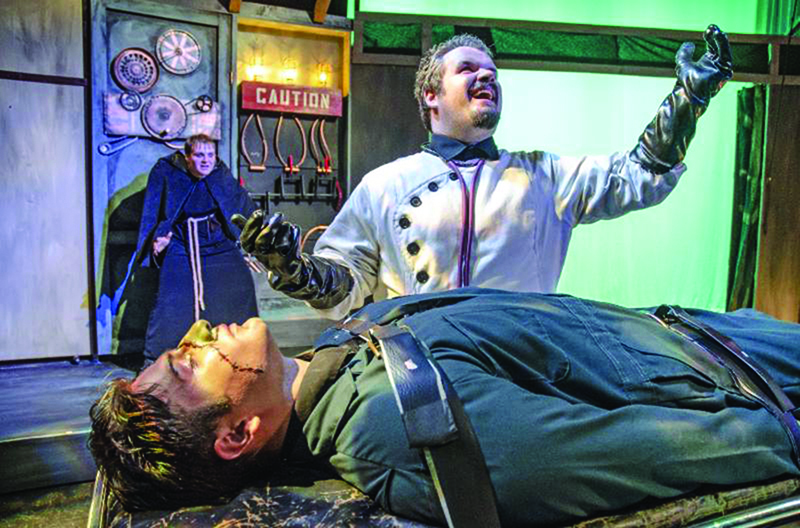 “Young Frankenstein,” Detroit’s Mercy’s latest theatre production, is wrapping up soon – with final shows scheduled for this weekend, April 12-14. The musical comedy has received acclaim from multiple several publications, including Encore Michigan and The News Herald. The production is being directed by Gregory Grobis, an associate professor of performing arts, a department chair and managing director of The Theatre Company. Some students may recognize the name Young Frankenstein from the Mel Brooks film that featured Gene Wilder as the lead actor. This adaption is similar, yet much different. Frederick Frankenstein, the grandson of the infamous Victor Frankenstein, inherits his family’s estate in Transylvania. When his science experiment escapes, a monster chase begins. “With such memorable tunes as ‘Transylvania Mania,’ ‘He Vas My Boyfriend’ and ‘Puttin’ on the Ritz,’ this musical is scientifically proven, monstrously good entertainment,” states the theatre company’s website. Grobis said that the students are the real focus of the production. Everything that is done is to further their education and their evolution as actors, he said. The production features professional actors, because the Theatre Company is a recognized as a professional theatre. The Theatre Company also does something unique with casting. Student actor Preston Cornelius, a sophomore theatre major, plays Igor in the production. He appreciates the opportunity to work with established actors. “I’ve been in shows where I’ve worked with professionals, and every time I do I always learn something from them … like a new warm-up, how they carry themselves in a space, things like that,” he said. “Young Frankenstein” is the first big production that Cornelius has been in since starting his student career. “My favorite experience about being in the production is as soon as I enter till I leave the stage,” he said. The student actors had to train hard for the production because the university does not offer vocal or dance lessons. The students had to find other ways to hone their skills through hard work. Bridget Smith, a senior who plays Frau Blucher, expressed some sadness at the fact that she is leaving at the end of the semester. The production seems to have been a great experience for those involved. “My favorite part about this production is working with all of the theatre students one last time before I graduate,” she said. “Young Frankenstein” is running at the Marlene Boll Theatre at 1401 Broadway St. in Detroit. Tickets are available at The Theatre Company ticket office in the basement of Reno Hall, room 43. Hours to buy tickets are from Tuesday to Friday from noon to 5 p.m.